The 9 Best Christmas Tree Farms in Indiana! It’s getting to close to that time of year again. Time to start thinking about setting up the Christmas tree and preparing for Santa. Christmas is also about families getting together and making memories last. One of those memories should be taking the family to a true Christmas tree farm, and there are plenty to choose from in Indiana. Here are the 9 best in the state! Open every weekend starting in Thanksgiving, Bohman Christmas Tree Farm is the best place in Indiana to find the picture-perfect tree. The family farm has been in business since 1968, and has been providing excellent customer service, as well as some of the most beautiful trees ever since. Bring the whole family, including your furry four-legged friends and enjoy a wagon ride as you browse through the numerous selections of Fraser fir, Canaan fir, scotch pine, and beautiful white pine tree. No need to bring a saw! Bohman’s provides one for you. They even help you load it and make sure that it’s perfect before you leave. There are also pre-cut trees available as well. Library Christmas Tree Farm is in the northern part of Indiana, and has been family owned and operated since 2007. Here at Liberty, you’ll find a beautiful selection of U-cut and pre-cut Christmas trees. They also have a gorgeous selection of hand decorated Christmas wreaths available, and even provide Christmas tree stands for those who don’t have one. Worried about what to do with your tree after the holidays are over? Be sure to buy one of their Christmas tree removal bags before you leave. And don’t forget to indulge in a free bag of popcorn and cup of hot chocolate as you browse! With two locations in Lafayette, Cassens Trees has a beautiful selection of Canaan fir, Douglas fir, and spruce trees to make your house even more festive this holiday season. Each tree stands up to 20 feet-tall, and they’ll help you cut and load your tree. They also offer an abundant selection of scotch pine trees that are a bit smaller for those who don’t want or need such a large tree. Located three miles from Burlington, Cruise In Christmas Tree Farm is another choose and cut farm, where customers can pick the tree that best suits their needs. They offer free "tree shaking" to remove all dead needles, free "tree bailing" for a safe travel home, and they even provide the saws to cut down your choice of tree. There are also free wagon rides, hot chocolate and apple cider, as well as a bonfire! Need a beautifully made Christmas wreath? They have those too! Come to the Sambol’s Tree Farm in Fortville, Indiana, where you’ll find hay rides, Gloria’s food truck offering dozens of delicious treats from homemade chili and soups, hot cocoa, and so much more to warm you on a cold winter’s day! Sambol’s Tree Farm began in 2009, and prides itself on providing outstanding customer service, a friendly staff, and plenty of family fun—as well as the highest quality of Christmas trees. They are also sponsors of the City of Fishers Tree Recycling Program, which properly disposes of and recycles used Christmas trees. Come to Dull’s Tree Farm this year and get ready to have some fun! In business since 1985, Tom and Kerry pride themselves on having one of a kind, beautiful Christmas trees. They also have handmade wreaths available, a petting zoo for the kids, and an amazing gift shop inside an original, one of a kind log cabin! Here, Christmas is a way of life and each tree has the Dull’s Farm seal of approval! One other thing that sets Dull’s apart from other tree farms is their “Trees for Troops,” in which donated trees are shipped to military bases stateside and overseas to provide a little Christmas cheer to our wonderful troops. Continue the tradition of cutting down your own Christmas tree this year at Holiday Hill Christmas Tree Farm in southern Terre Haute, Indiana. They offer choose and cut trees available, as well as pre-cut trees. Choose from the beautiful scotch pines, Douglas firs, or white pines. Each tree ranges in height, from four feet to 10 feet. Pre-cut trees are between six and nine feet. Be sure to visit the Warming Hut for a free hot beverage while you shop! Tower Family Christmas Tree Farm is a great family owned and operated farm. In business since 1992, Cathy and Ed Tower have been providing residents of southern Indiana with gorgeous trees. They are a choose and cut only tree farm, and have trees brought in from West Jefferson (Indiana), North Carolina, and Plainfield, WI. 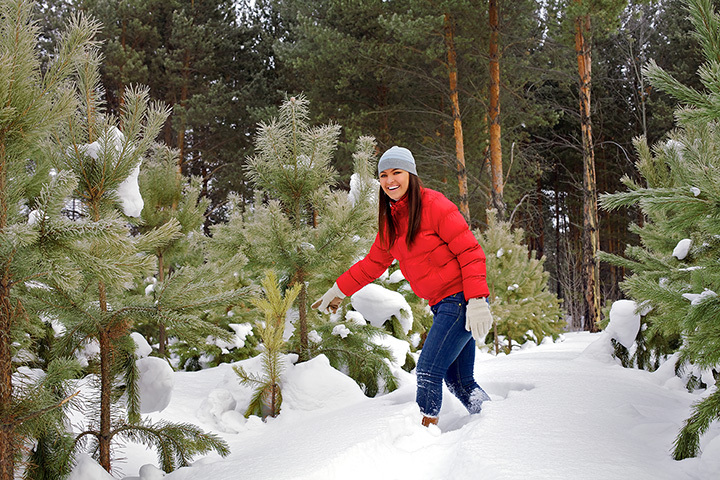 Whether you prefer pines, Norway or balsam, or a pre-cut Fraser fir, there is a tree for everyone!